Community initiatives are notoriously difficult to evaluate. This is because neighborhoods are complex and it is hard to untangle and measure causal outcome drivers among the economic, demographic, and institutional forces that can influence, support, or undermine investments aimed at local improvement. This same complexity also makes it difficult for evaluators to develop a convincing counterfactual, or representation of what might have occurred without the community intervention. Counterfactual comparisons are best established through experimental research designs that ensure that treatment and control groups are alike. But even in the rare cases where neighborhoods, towns, or cities may be part of randomized controlled trials or rigorous quasi-experimental studies, it is unusual to have sufficient numbers of participating communities to reliably determine whether places are truly comparable on average because they may differ in less observable, but still relevant, ways related to institutional factors such as service capacity or political leadership. 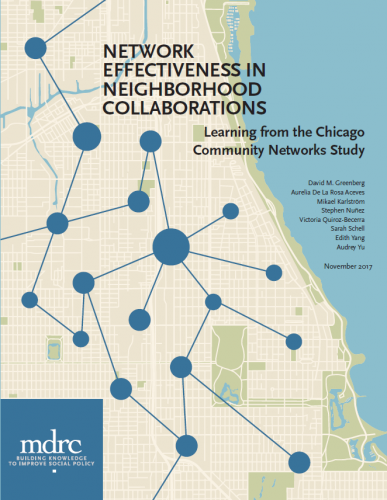 MDRC’s Chicago Community Networks (CCN) study uses a methodologically innovative approach, known as social network analysis, to develop an extensive understanding of these more intangible features of neighborhood life. Funded by The John D. and Catherine T. MacArthur Foundation, the CCN study is one of the most extensive attempts yet to characterize and measure the strength of networks among community organizations and show how they contribute to more successful partnerships for service delivery and political leadership.